Yesterday Kim, Lucas and I headed over to Prospect Park in Brooklyn, NY to spend the day at The Great GoogaMooga. The Great GoogaMooga is a food, drink and music festival taking place for the second year. The food vendors were from top restaurants all over the city. There was also beverage tents featuring many wineries and breweries. We didn’t know any of the musical acts besides the closing one- Matt & Kim which we did not stay for. The festival is free to attend as long as you have a ticket which are given out through an online lottery. This year we didn’t get selected but a friend had an extra pair of tickets for us. There is also a paid option which we did not consider. The food was pay as you go and each booth has their own prices ranging from $5- $16 per item. The pizza area had three booths, all being be solid options. Roberta’s, Pizza Moto and South Brooklyn Pizza were representing. We went with a small pie from Roberta’s which cost $10. The pizza was decent but nothing to write home about. 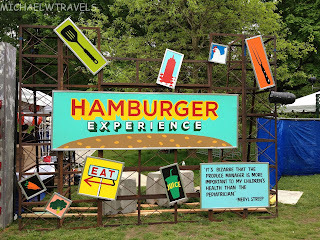 I remember it being better at last year’s event as well as at their restaurant in Williamsburg. The burger area had lots of options and it was tough to pick which to go with. DuMont, Brindle Room, The Burger Joint and Umami Burger (coming soon to NYC) were cooking up burgers. We decided to go with a burger I’ve never tried, Umami Burger. The burger had truffle cheese, truffle glaze and garlic aioli. I’m not a fan of truffles but the burger happened to be awesome. I was really impressed by the flavor and look forward to checking out Umami Burger when it opens in NYC. Another favorite was a BBLT, bacon, balls, lettuce, tomato & mayo from The Meatball Shop. I chatted with co-owner Michael Chernow before ordering. 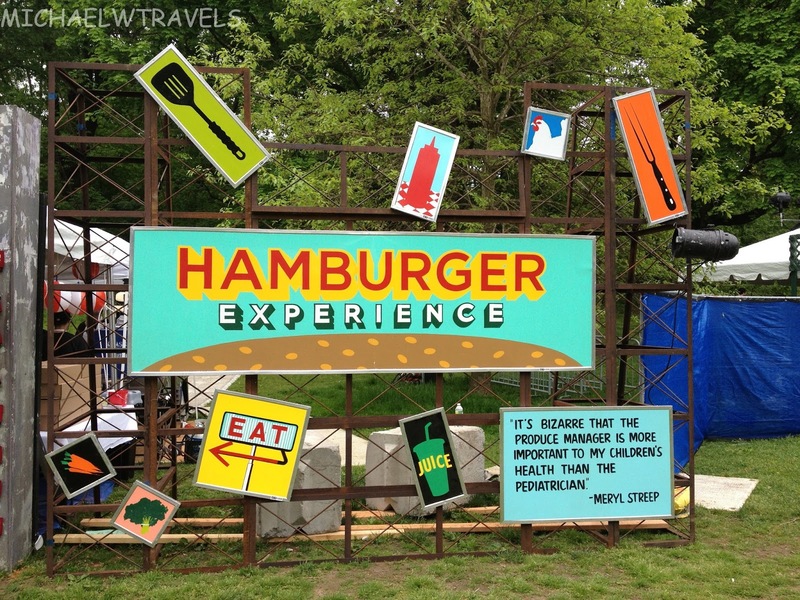 We spoke a little about their expansion and the GoogaMooga event. The sandwich was full of flavor and very tasty. I really need to head over to one of their locations one of these days. Both times I tried their food, I’ve really enjoyed what I had. We had two desserts at the festival. One of them was probably my favorite thing that I ate all day. The Robicelli’s Car Bomb Parfait had lots of flavors going on. It was a very rich and tasty dessert. The base was a Guiness stout brownie, awesome in itself and you could really taste the beer flavor. It was topped by Bailey’s cannoli cream, Jameson whiskey ganache and beer nut praline. I usually do not eat cannoli cream but Robiccelli’s did their magic and made it awesome. The chocolate ganache was also great. I would’ve preferred more peanuts in the nut praline but you really could not go wrong with this dessert. The ice cream sandwiches from Melt Bakery were also a solid choice. I had the Morticia, chocolate cookies with malted chocolate rum ice cream. It was chocolatey but not something I would want again. Kim really enjoyed her ice cream sandwich though. She had Cinnamax, snickerdoodles with cinnamon ice cream. I took a bit of it and found the ice cream not to be enjoyable (I’m not really a fan of cinnamon though). We didn’t really visit the beverage tents since we brought our own water. We did share one beer which was very good but I forgot it’s name. While wandering around we came across this chicken spreading the word about the upcoming opening of a Blue Ribbon fried chicken shop. Lucas got a good laugh out of the chicken costume. American Express had a tent set up with a few demonstrations and a wheel to spin for prizes. The top prize up for grabs were $25 gift cards. Kim won a towel, I won an apron and my friends each won a spork! The main sponsor was Lexus. There were cars spread out around the festival to check out. They also had a yurt (a Mongolian tent) set up with a photo booth inside. Our picture came out pretty bad as half my head was cut out. They also gave out GoogaMooga trading cards in which one pack held a golden ticket. The lucky winner will win a free one year lease on a Lexus. Lucas’ favorite area (mine too) was a pretty ridiculous, yet fun one. 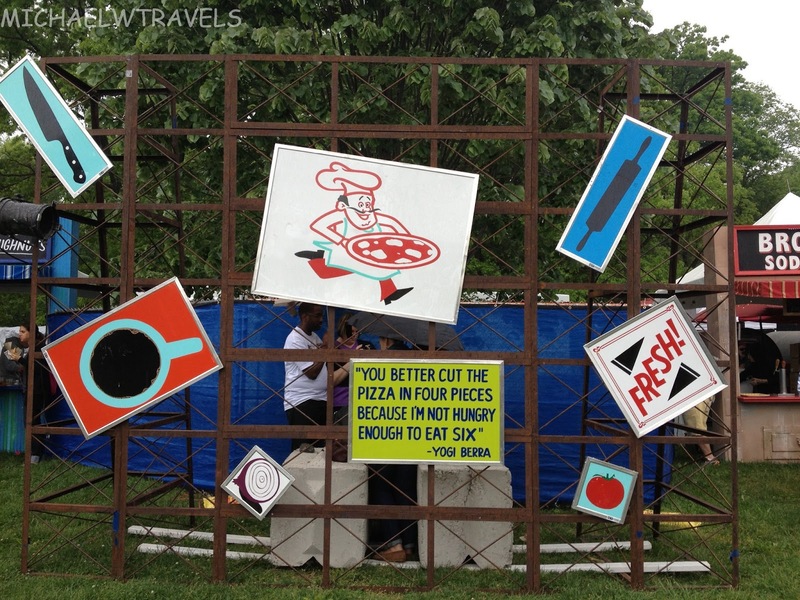 Roberta’s Pizza had an Urban Renaissance Faire Pop-Up space. This drew a pretty decent crowd. They had a section set up for LARP- Live Action Role Playing. People signed a waiver, got dressed in armor and took turns sword fighting. (No I did not participate!) They also gave out some foam swords so we had fun fighting with those. In the Roberta’s Ren Faire they had a DJ booth set up. Lucas absolutely loved the music and clapped away and did some of his signature dance moves, bending up and down. He had many admirers as well as some shout outs from the DJs! Overall, the GoogaMooga was a fun event. It wasn’t nearly as hot out as last year which made it more enjoyable but we also had some light rain on and off throughout the day. It was also organized much better with lines being no longer than 10 minutes. If the event returns next year, I’ll definitely try to get tickets again. Find out more about the Great GoogaMoora HERE.